Over the last 13 years, Indian producers have managed to acquire a significant share of the cucumber market in Russia. In the current environment of sanctions, imports from India are set to grow. Pickled and marinated cucumbers have been an essential part of traditional Russian cuisine for many centuries. These traditions did not even change during the time of socialism. It is true that back then Russians grew and preserved cucumbers themselves. But now private companies are engaged in this activity and globalization has aided them in finding suppliers of cucumbers from other countries that can provide the appropriate level of quality at a competitive price. Over the last 13 years, Indian producers have managed to acquire a significant share in the total supply. About one-third of the pickles in jars and barrels in Russia today have come from India, Managing Director of JSC Vial Inter Niraj Kumar told RIR. He believes up to 25 Indian entrepreneurs are currently supplying Russia with cucumber-products. In Russia, raw cucumbers undergo a repacking process. They are rinsed of the excessively salty brine or Acetic acid, traditional spices are added, and they are preserved and resold under Russian consumer brands. Majority of marinated gherkins exported to russia are bottled in India and are of smaller sizes( cornishon and mini cornishon). Russian companies order this product in their trade mark. Surprisingly, Indian suppliers were able to break into the Russian market rather quickly, considering the fact that India only started growing this vegetable at an industrial scale in the 1990s. In the early 2000s, Indian products were still practically impossible to find. Kumar was one of those involved at the beginning of Indian companies’ conquest of the market. “In 2002 the India Show Exhibition was held in Moscow. It was attended by the leadership of APEDA – an organization that promotes Indian agricultural products around the world – as well as representatives from the state of Karnataka, where nearly 60 percent of Indian cucumbers are grown,” Kumar said. “At that time I didn’t know that India had started commercially growing cucumbers. The representative of this state Mr Vivek and I decided to supply Russia with the product and signed our first agreement with the company Roskonservprodukt, located in Veliky Novgorod.” They obtained certification along with as Russian company and after that began shipping to Russia. Over time the number of Indian suppliers increased. “In time it was decided to supply our products to a company that works in Russia under the brand Skatert-Samobranka . It helped us a great deal in creating a recipe that conformed more closely to Russian taste preferences,” he said. Now, Indian marinated cucumbers are sold in the largest retail chains operating in Russia – Auchan, Magnit. However, the path to Russian shelves was not easy. “For a long time we could not get the taste right for the Russian palate but the biggest problem was the temperature drop in winter. We had shipped the product at plus temperatures, but when it got to Russia, the temperature on the street was minus 24. And no matter how we insulated the containers, everything froze anyway,” Kumar said. Now his company supplies modest volumes of cucumbers to Russia, concentrating on marketing high quality tea packed in India under the brand Nargis, which is “a bit higher than average” price range. Igor Bondarev, CEO of the canned-goods distributor Vkusovye Konservy – the same one that sells products under the Skatert-Samobranka brand – confirmed that among his suppliers there are always 4 or 5 companies from India. For example, Indian suppliers accounted for 80 percent of the gherkins segment. Bondarev believes that there may now be an additional demand for Indian products because of two events, the sanctions war between Russia and the West and the change of taxation on goods supplied from Ukraine and Moldova. “Yes, it appears there will be a modest increase in demand. For example, at the very least, we will have to replace products from Moldova,” Bondarev said. He pointed out that Moldova supplies Russia with mid- (6-9 cm) and large (9-12 cm) sized cucumbers. But in India, in his opinion, it makes sense to buy small cucumbers with which the size of 6-9 cm is the most extreme limit. All the same, he is sure that imports of marinated cucumbers from India will increase by 10 percent because of the sanctions factor alone. “As far as repacking is concerned, that is a different project which, probably, will also grow because of restrictions on the supply from Moldova,” he stated. Niraj Kumar doubts that Russia will be able to meet its demands completely from India. He pointed out there are more and more retail chains in India that have started to buy fresh fruits and vegetables from producers having cold chain management facility. 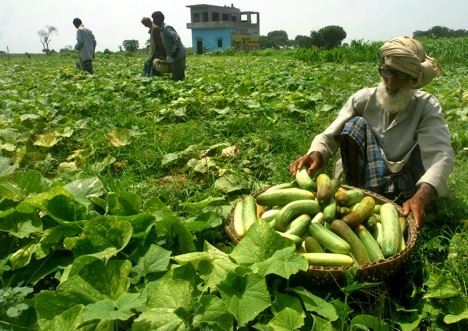 It has become profitable to produce other goods and reduce the area under cucumber cultivation.